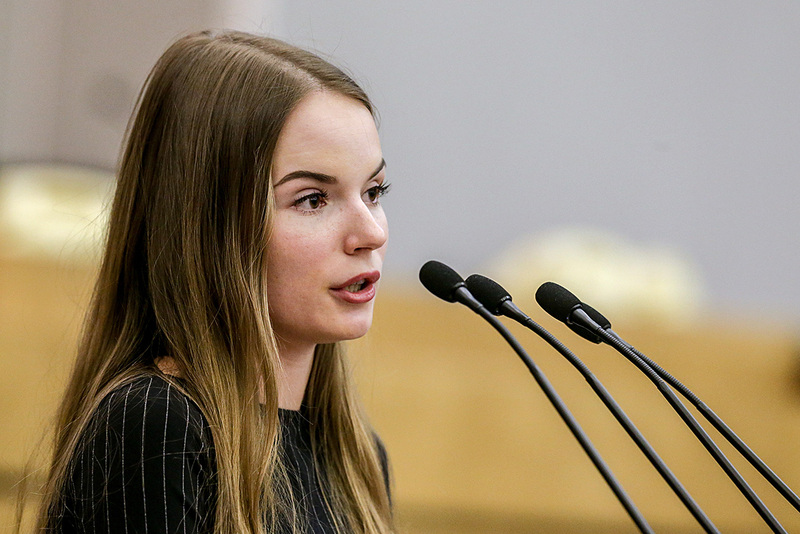 Russian video blogger Sasha Spilberg speaks during parliamentary hearings on the youth policy in Russia. A beauty blogger speaks at the podium in parliament, anti-protest rap appears on the net, an oligarch records a video message and becomes a meme. While the government is looking for a new language to communicate with the youth, YouTube becomes the season's political trend. A 19-year-old female blogger stands at the podium of parliament's lower chamber and in five minutes explains that subscribers are also voters and a mini video is a mini election. "I don't remember a video blogger speaking in any country's parliament before… I've been transparent since I was thirteen… Be transparent! Make videos on YouTube, post your messages on VKontakte or any other social network," the girl calls out with a shivering voice, reading the text from her smartphone. The blogger's name is Alexandra Balkovskaya, but on the Internet she’s known by her pseudonym Sasha Spielberg. She’s a YouTube star among 10 to 14-year-olds, having found fame thanks primarily to stories about her hamster. Now Spielberg's subject matter revolves around choosing the right bath foam so that it looks pretty or how to photograph yourself for Instagram. But she did not come to the State Duma to speak about this. Her mission, she believes, is to improve the dialogue between the YouTube community and the government, or better, between youth - who choses YouTube instead of television - and the government. It was the youth who a couple of months ago unexpectedly, in the government's view, took to the streets in hundreds of Russian cities to protest against corruption, was hanging on lampposts and making speeches on the squares. The Kommersant newspaper called (in Russian) this the use of videobloggers to fight street protests; journalists called (in Russian) YouTube the political trend of the season. When people in Russia speak of youth policy, its main problem and characteristic is always "reactivity," say political analysts. The politicians think of the youth only when the situation is almost out of control - whether it’s the threat of an "orange" revolution or an internal protest with social-political roots. In the middle of the 2000s the flagship among the pro-Kremlin movements were the Nashi youths. "They appeared as a response to the "color" revolutions, which had spread throughout the CIS countries in 2005. And it was effective. More than 60,000 people went out onto Leninsky Prospect in Moscow on May 15 with flags and patriotic slogans, saying this is the number of people who are willing to support the government at the moment, but if necessary the number can increase to 300,000, no problem," says General Director of the Institute of Political Studies Sergei Markov, who is close to the Kremlin. The Nashi (meaning "ours") were funded heavily by the state: From 2007 to 2010, in accordance with state contracts and in the form of grants, the movement and its associations received 467 million rubles (about $8.3 million). And this does not include private or sponsorship money. "Yes, the Nashi not just existed, they were also very resonant. Then they left," notes member of the expert council at the Institute of Socio-Economic and Political Studies Alexei Zudin. Afterwards, as the threat of the revolution died down, the movement began to dry up, its bureaucracy dominated - everything was on paper, people spoke a lot but did little, explains the political analyst. First the political component shifted to social projects but then the projects also ended. In Markov's words, they ended precisely when this youth did not take to the streets to defend the government in 2011 during the protests against dishonest elections and Vladislav Surkov left the administration. "The problem was not that the format did not work. The project had been abandoned, that's all." The last protest on March 26, which had been provoked by oppositionist Alexei Navalny's film, allegedly about a secret "corruption empire" owned by the Russian prime minister, started on the Internet. That is why the parliamentarians decided to appeal to the youth precisely through the Internet. Actually, the first attempts to fix the situation began not with the invitation of videobloggers to Parliament, but through a pop singer. Several weeks before Spielberg's speech, a video by former singer from the band Leningrad Alisa Vox thundered on YouTube. She sang about students who go to protests. The protagonist of the song "takes his poster with his immature hands" and receives a D in History. "You want changes, kid? Then start with yourself," sings Vox and suggests "not to meddle in politics" and "study theory." Then, almost simultaneously with Vox's "Kid," a video by rapper Ptakhi appeared on the Internet. He was singing "Freedom 2.017" with the same anti-protest message. He claims the participants of the March demonstration protesters are paid "with Uncle Sam's money. Soon the liberal mass media cited two sources close to the Kremlin saying that the video "Kid" was commissioned by former senator and former presidential administration employee, Nikita Ivanov, and the performers received two million rubles for it (about $35,500). Yet, the biggest sensation was created by a video message recorded by oligarch Alisher Usmanov (the fifth wealthiest Russian, according to Russian Forbes, whose fortune is worth $15.2 billion) to top-blogger Alexei Navalny, which in one day gathered more than one million views. Usmanov was one of Navalny's targets in the film, also accused of corruption by the opposition. In the message Usmanov uses various ways of addressing the oppositionist, from "say you're sorry, please" to "liar" to "you're still going to have to respond to me." He finished his speech with the words, "I spit on you, Alexei Navalny," which immediately became an Internet meme and Usmanov was hailed as the highest-paid blogger (the message was recorded, it appears, from his private yacht). Several days later the oligarch released a second video, improving, as many have noticed, the lighting and the composition. Many Russian mass media sources say Usmanov decided to fight Navalny on his own turf because he wanted to appeal to the generation of bloggers. This does not mean that in 2018 Vladimir Putin will appear on YouTube and that it will have 450 new channels, in accordance with the number of parliamentarians, Markov believes. Moreover, the government will not save money on new youth movements (the ministries are already discussing the amount). "Internet communication will also be developed without saving efforts. The question is how successfully, though. Here the government still feels rather insecure and it only wants to work with people who obey it. And those who obey are almost always bureaucratized. For me it's difficult to perceive even Usmanov's message as a message to bloggers. He made many errors. Most likely, it only proves that there is a need for the government to start a dialogue in this language, but also that it doesn’t know how to. What did Usmanov do in the end? He threatened using "ty" (the informal Russian form of "you").